Home equity line of credit vs. a mortgage: Is there a difference? Home equity line of credit vs a mortgage: Is there a difference? There are many terms associated with financing for a home. There are so many, in fact, that it is easy for first time home buyers and veteran homeowners alike to get lost in a heap of unfamiliar terminology. When applying for home financing, for instance, it is important that you know the difference between a home equity line of credit and a mortgage. Although they sound like they are similar, they have some very important differences that you must understand in order to know which is the best one for you to apply for. To help you with this, we are going to do a home equity line of credit vs. mortgage comparison. A mortgage is the most common type of home-related financing. In essence, it is when a lender pays the majority of the upfront cost for a home and the homeowner pays the loan back -- with interest -- within a specified period of time. The interest rate for a mortgage can either be fixed or variable rate. Generally speaking, a home buyer pays at least a portion of the cost of the home with their own money upfront. Although they did not pay the upfront cost for the home, the mortgage holder is still the owner of the home. If the mortgage holder defaults on his or her loan, however, the ownership of the property transfers to the lender. A home equity line of credit is a type of financing that is exclusively available to those who already own a home. In essence, it provides a pool of cash that the homeowner can access whenever they need it. 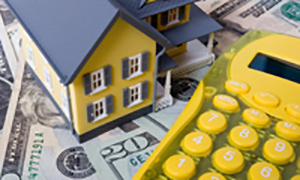 Generally speaking, the interest rate for a home equity line of credit will be variable. Although a home equity line of credit often receives comparisons to a credit card, they are very different in that a home equity line of credit is secured. This means two things: first of all, if a homeowner defaults on a home equity line of credit, they risk losing their home to the lender. Secondly, due to the fact that home equity lines of credit are so secure, lenders are usually willing to provide a greater line of credit than a person would normally be able to receive with a regular credit card. Both of these financing solutions are large loans that are backed by the value of your home. As with all loans, they both include interest rates that affect how much you end up paying in the long run. A mortgage is a loan designed to help people purchase a home. A home equity line of credit, on the other hand, is a pool of cash that is made accessible to those who already own a home. A good mortgage broker will streamline your ability to obtain home financing, whether you need a mortgage, home equity line of credit or something else. They will also make sure that you find the best rates available to you.